Founded in 1960 by Seymour Martin Lipset and Stein Rokkan, the CPS comprises both political scientists and sociologists. It represents them as IPSA (International Political Science Association) Research Committee 06 and ISA (International Sociological Association) Research Committee 18. For a detailed description, please visit the page 'About us'. The board elected for the period 2014-2018 can be viewed here. the electoral phase to renew the CPS Executive Board for the period 2018-2022 has been closed and the final results are now available. Below, you may find the list of names and the total of valid votes obtained. More details can be read in the final electoral report. The election of the new CPS Chair will take place in September 2018. The CPS will keep all members posted. The Summer 2018 issue of the CPS Newsletter has been released. Read it here. The Institute for Social Change and Sustainability of the Vienna University of Economics and Business (Austria) will be hosting an international research workshop on 'Transition Impossible? Ambiguous Transformations and the Resilience of Unsustainability'. The workshop will take place on 19-21 September 2018. The main aim of the workshop is to conceptualize recent socio-political developments in modern societies. Both conceptual and theoretically informed empirical papers are welcomed. Please, consider that limited travel/accommodation support might be available. A detailed descriptiona and relevant information may be found in the extended call for papers. The CPS Newsletter of Winter 2017 has been issued. The newsletter includes a summary of the international Conference 'Redefining Political Sociology', held in Santiago de Chile from 11 to 13 December 2017; the link to read the new CPS statutes to be approved at the next 2018 ISA or IPSA World Congresses; the links to see sessions and panels organized under the umbrella of CPS at the 2018 ISA and IPSA World Congresses. The issue can be read online. The international conference 'Redefining Political Sociology' is approaching. The state of discipline as well as salient topics in various subfields will be discussed by leading scholars from different parts of the world at the Andrés Bello University of Santiago de Chile, 11-13 December 2017. See how to register and all the relevant information, including an extended programme below on this website. The International Conference on 'Redefining Political Sociology' will be held in Santiago de Chile on 11-13 December 2017. The Conference will be based at the Andrés Bello University of Santiago, in collaboration with the Committee on Political Sociology (CPS). Several leading scholars in the field of Political Sociology from different continents will be gathering to discuss the state of the discipline and its different aspects as well as to advance our knowledge of various disciplinary sub-fields. Topics include political elites, gender and politics, social movements, democracy and citizenship, organised crime, and local politics and civil society. For registration, please follow this link. Similtaneous translations in English and Spanish will be provided to both presenters and registered attendees. Here, you can see instead the poster presentation of the event. You are welcome to submit panel and paper proposals for the CPS section, chaired by Emilie van Haute (Université Libre de Bruxelle) and Laurence Morel (European University Institute). This is the abstract. We welcome panels and papers that aim at understanding the determinants of citizens’ assessment of parties, but also that aim at understanding how these assessments are related to party (elite) resentment among citizens. The deadline is 16 January 2018 (11.59 p.m., local time). Further information on the rules and instructions as well as the link to submit the proposals may be found on the Call for Proposals page. I just want to remind you that the deadline to answer the call for papers/panels for the IPSA World Congress of Political Science in Brisbane, July 2018 is approaching. The period for sending proposals will close on October 25, 2017. You are very welcome to propose a contribution within the Research Committee on Political Sociology's session (RC 06). Instructions on how to submit papers and panels (and further information) may be found on the Congress website. The CPS Summer 2017 has been issued. The newsletter includes a call for papers of the next 2018 ISA World Congress; a call for panels and papers for the next 2018 IPSA World Congress; and the announcement of the next Conference 'Redifining Political Sociology', to be held in December 2017 in Santiago de Chile. The issue can be read online. 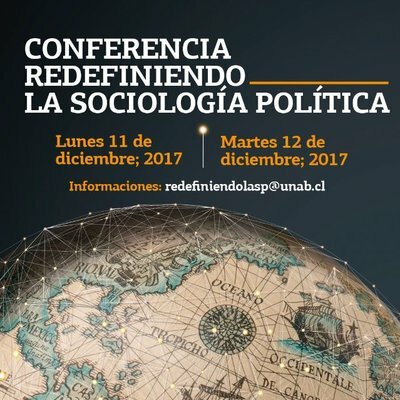 The CPS and the Andrés Bello University are glad to announce a Call for Papers for a Conference on Redefining Political Sociology, organized by Laurence Morel (University of Lille, France), Stéphanie Alenda (Andrés Bello University, Chile), Joshua Dubrow (Polish Academy of Sciences), and Simón Escoffier (Autónoma University, Chile). The Conference will take place on 11-13 December 2017, in Santiago de Chile. The purpose of this conference is to build a debate on the future of political sociology. The organizers welcome papers both with a disciplinary focus or focusing on critical research on thematic subfields. Abstracts should be sent to: salenda@unab.cl (Stéphanie Alenda) or sescoffier@ichem.cl (Simón Escoffier). • Title of the paper. • Name, affiliation, and address of all authors, the presenting author (please underline her/his name) should be the person submitting the abstract. • Name of the panel in which the paper should be presented. The full presentation and program of the Conference, the panels, and the list of sponsoring and supporting institutions may be found in the extended version of the Call for papers. A Call for Sessions is open for the XIX ISA World Congress of Sociology, to be held in Toronto from 15 to 21 July 2018. The CPS has launched a call on the theme Dynamics of States and Identities in Contemporary Global Era (Programme Coordinators: Stéphanie ALENDA and Eswarappa KASI. Chair: Laurence MOREL). You may find details and information by reading the Call_for_sessions). Please, consider that the deadline to reply to this call or to propose other sessions is 15 March 2017. The Call for Papers is open for the International Research Workshop on 'Activation - Self-Management - Overload. Political Participation beyond the Post-democratic Turn'. This workshop will be held from 27 to 29 September 2017, organized by Ingolfur Blühdorn and Felix Butzlaff of the Institute for Social Change and Sustainability (IGN) of the Vienna University for Economics and Business. In particular, the workshop focuses on societies whose political culture has been shaped by the European project of Enlightenment and modernity. Works from scholars from all academic disciplines are welcome. There is no conference fee. The deadline for paper proposals is 19 March 2017. More detail and further information may be found in the full Call for Papers. The CPS will be present at the next 2017 APSA Annual Meeting on 'The Quest for Legitimacy: Actors, Audiences and Aspirations' (31 August-3 September 2017, San Francisco, USA) with the panel 'The Legitimacy of Political Executives in Democratic and Authoritarian Regimes' (see detail), organized by Ferdinand Müller-Rommel (muero@uni.leuphana.de). Papers dealing with this topic are invited. The procedure to propose a paper closes on 9 Janurary 2017. A call for papers is open for three workshops to be held at the 2017 ECPR Joint Sessions of Workshops (25-30 April 2017, Nottingham, UK). The workshops are organized by the CPS Working Group on 'Member and Activists of Political Parties' (MAPP). The procedure to propose a paper closes on 1 December 2016. The CPS has published a contribution for a debate on the state of Political Sociology as a field of scientific inquiry. This contribution aims to be a first of a series. The article, entitled 'The Interdisciplinary Hybrid: Some Discussions on the State of Political Sociology', is co-authored by Joshua Dubrow (corresponding author, dubrow.2@osu.edu), Marta Kolczynska, and Anna Gromada. You can access the pdf version here. The CPS Conference held in Sciences Po Paris on September 22-23 on 'Referendum Politics, Policies and Political Effects of Referendums in EU Countries' (see programm) gathered experts on the subject from all over Europe. Thanks again to IPSA (International Political Science Association) and Sciences Po for their financial support! The Conference will have as an output a book, which is to be published by Routledge next year. The CPS released the October 2016 issue of its newsletter. You can read it here. CPS will be present at the next American Political Science Association (APSA) Conference in Philadelphia, 1-4 September 2016. CPS will promote a panel on 'Migrants' Representation. The Role of Parties, Electoral Systems and Mobilization' (chair: Luis Ramiro; discussant: Silvia Erzeel). Abstract: This panel examines the drivers of migrant’s political representation in Europe from a Political Sociology perspective. With novel data on all national MPs coming from the Pathways project (http://www.pathways.eu/) for eight European countries – Belgium, France, Germany, Greece, Italy, the Netherlands, Spain and the United Kingdom – for the period since the early 1990s, the four papers examine how political parties, electoral systems and mobilization from various groups shape the levels of political representation gained by citizens of immigrant origin (CIOs) – migrants and their descendants – across Europe. You can access further information on paper givers and paper abstracts here. CPS is proud to announce that a Conference on 'Referendum, Policies and Political Effects in EU Countries' will be held in Paris (France) on 22-23 September 2016. The Conference will be held under the auspices of the Research Committee on Political Sociology of the International Political Science Association (IPSA RC06/ISA RC18); the Research Committee on Elections, Citizens and Parties of the International Political Science Association (IPSA RC23); and the Research Group on Democratic Procedures (PROCEDEM), CEVIPOF. The event is sponsored by CEVIPOF, IPSA Committee on Research and Training and IPSA/ISA Research Committee on Political Sociology. The Conference will be introduced by a keynote lecture of Guy Lachapelle (IPSA Gen. Secr., Concordia University, Montréal) on: How to organize a referendum to be sure that its result will be respected? The Conference benefits from two IPSA seed grants. You may find a detailed presentation of the Conference in English and French, by clicking here. The full programm can be read here.